"Join hundreds of local cyclists for the 2017 Florida Bike Month grand finale on March 31st. Let's celebrate bike month with a special Critical Mass after party at the new Omni Park located less than 1 mile from Government Center. Enjoy food, drinks, music, skate demos, and more. Admission is FREE. The Magic City Bicycle Collective will have a tent and repair stand set up at Omni Park. They will demonstrate simple bike care and do minor bike repairs and maintenance. Come to them if you need air in your tires. Buy them a beer, purchase a t-shirt or make a donation! Our friends at The Miami Bike Shop will also be there with bike lights, u-locks, bells, and small items you may need to purchase. Bring your bike lock! The park is not responsible for lost or stolen items. Don't lose your bike by being careless. Do not leave your bike unattended if you do not have a good lock. 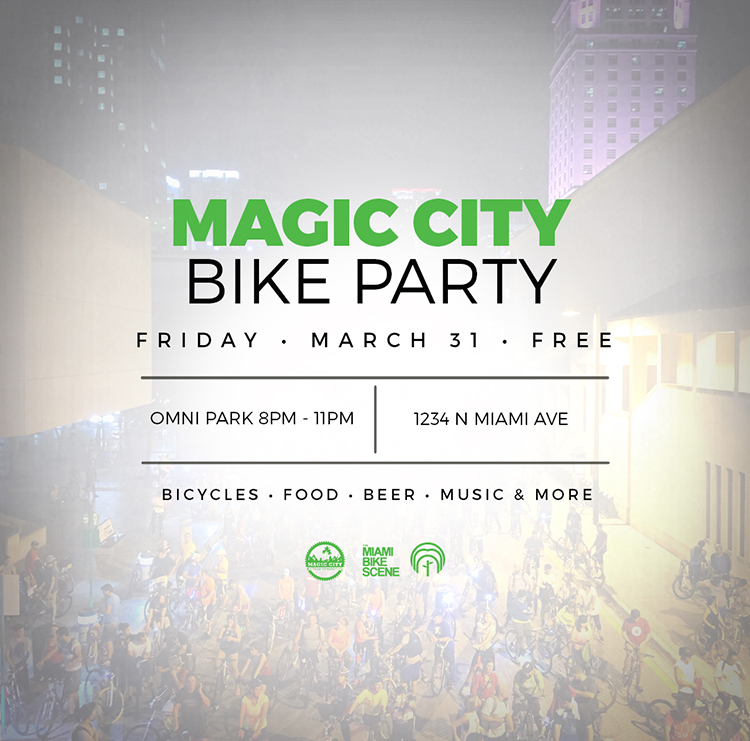 The Magic City Bike Party is a collaborative effort between Magic City Bicycle Collective, The Miami Bike Scene, Omni Community Redevelopment Agency, Urban Implementation, and Poplife." 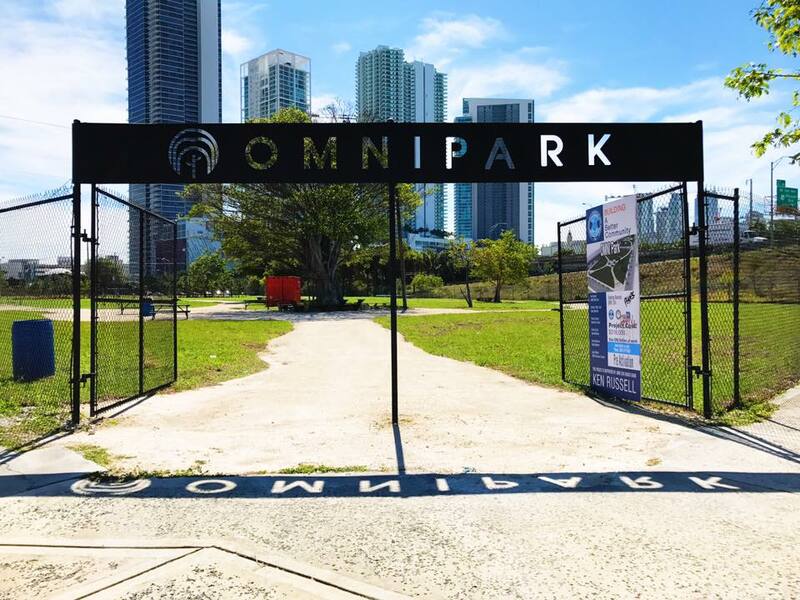 "Omni park is a temporary activation on vacant land that is designed to beautify, activate and connect the Omni neighborhood. Omni park includes a skate park, concert facility, restaurants and public art and serves as a recreational facility for residents and visitors. The land is owned by the Florida Department of Transportation (FDOT) and Miami-Dade County and comprises more than 331,000 square feet or approximately 7.5 acres. The majority of these parcels are slated for the FDOT’s $600 million signature bridge project, eventually replacing I-395, and a parking garage for the Adrienne Arsht Center. Upon commencement of construction, Omni Park will cease to exist. It is expected that the lifespan of Omni Park will be 1-2 years. The park is made up of three different parcels. The easternmost area, or “Art Parcel” contains public art commissioned by the Perez Art Museum of Miami (PAMM) and created by renown local artist, Michael Loveland. The chickee huts and pine forests are reminiscent of the native Miami landscape and the Everglades. The central section, or “Zen Parcel” contains art and a large lawn and restaurants. Activities such as yoga and farmers markets take place on this parcel. The westernmost, or “Activity Parcel” contains the skatepark and concert facility. The majority on the park’s activities occur on this site. Omni Park is financed and sponsored by the Omni Community Redevelopment Association, chaired by City of Miami Commissioner Ken Russell. The concept and design are furnished by Urban Implementation, LLC whose principals Bradley Knoefler and Mark Lesniak are of Grand Central Park fame. Although the park is temporary in nature, more than 60% of its $318,000 budget are removable assets that can be relocated to another site once Omni Park is finished. Temporary activations have been proven around the world to be a catalyst for community redevelopment and to foster permanent economic development. To date, Omni Park is one of the largest temporary parks in the world."